The Double Bounce package is our most popular discounted deal. It's easy, one inflatable is full price the other is discounted. You get to choose which two inflatables are the best option for your event! Double Bounce Package deal: hire any inflatable amusement ride up to $500 value and receive a discounted second eligible inflatable/ride (see terms & conditions for eligible inflatables). Both rides are self supervised. Operators available for $39 per hour. * Double bounce package deal excludes Wizard Castle, Adventureland Bouncy Castle, Lost Temple Bouncy Castle, Captain Cook Bouncy Castle, Tiki Falls Water Slide and all Obstacle Courses as second discounted inflatable. Double Bounce and BucknBounce - second inflatable is self supervised and must be valued at no more than $500 hire value. 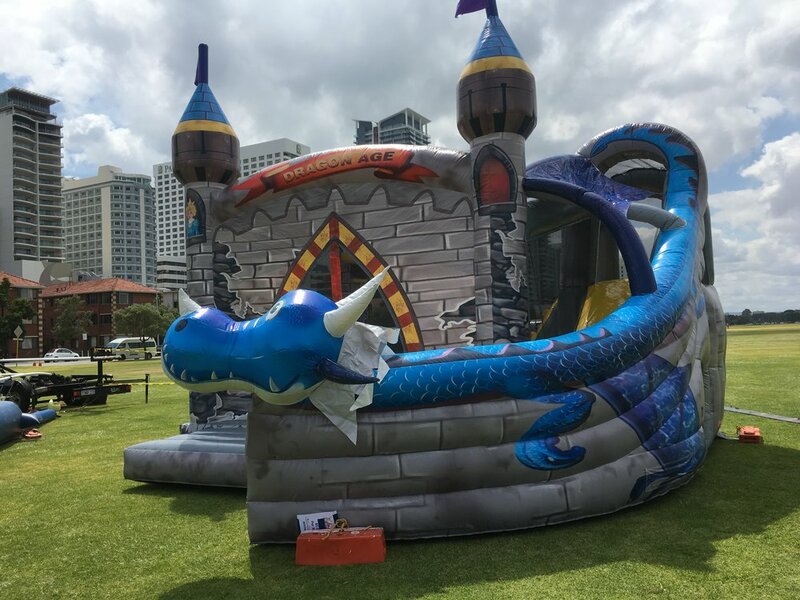 Captain Cook Bouncy Castle, Adventureland Bouncy Castle, Wizard Bouncy Castle, Lost Temple Bouncy Castle and all Obstacle Courses are excluded and do not qualify as second discounted inflatable. Triple Bounce - 3rd free Bouncy Castle choices are: Girl Thing Bouncy Castle, Superheroes Bouncy Castle, Ladder Challenge or Basketball Challenge. If choosing any other third Bouncy Castle/inflatable the $250 hire price will be based on the least expensive amusement ride hire price. Free Bouncy Castle is for first 3 hours of event hire and is self supervised. Standard additional hire charges apply after 3 hours. No other discount offers apply with package deals - only one package per booking. All packages are based on a 3 hour metropolitan hire and Client supplying their own power for all amusement rides. Metropolitan area is Joondalup to Mandurah. If operator not listed next to ride in our package deals then ride is to be self supervised (volunteer required). Friendly operators available for $39 per hour.